The craggy, flower covered Island of Capri is home to any number of artistic, historical and natural wonders. Although this "paradise of idleness", surrounded by the bluest of seas, has been enchanting visitors for centuries, in recent years more than a touch of cosmopolitan glamour has been added - in the the form of designer shops, luxury spas, sumptuous hotels and the holidaying glitterati. There is so much to see – from the ruins of Roman villas to splendid private residences set in flower-filled grounds glimpsed through intricately wrought gates. You can wander along little lanes, amidst gardens overflowing with bougainvilla, plumbago, grapevines and mandevilla. You can swing above roof tops and vegetable patches on the cable car to the mountain top. You can climb rocky paths leading to fabulous views of the island and the azure sea. Then, there is the thrill of the other face of Capri – the bustle of the streets and the Piazzetta, the bars, cafes, the fashionable boutiques, the grand hotels, the jetsetters’ yachts and the parade of the world's beautiful people. POMPEI and HERCULANEUM, The most visited archeological site in the whole of Italy. AMALFI COAST: From Punta Campanella, and the Sorrentine Peninsula, the spectacularly panoramic SS163 highway hugs the entire length of the Amalfi Coast, via an infinite series of knuckle-whitening hairpin beds. SORRENTO: built on the cliff tops, towering above the sea. 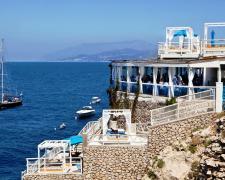 ISCHIA: the twin island of Capri, a little bigger that it really worth to visit. The first "beach" visitors see as they approach Capri’s harbor by hydofoil or ferry is that of Marina Grande, situated just steps away from the docks and equipped with bathing establishments and bars. Close to the seafront of Marina Grande there is a jetty used by boats to transport holidaymakers to the Bagni di Tiberio bathing establishment, near to Palazzo a Mare and the ruins of one of Tiberius’ Ancient Roman villas. From the Piazzetta of Capri, the beach of Marina Piccola is easily reached by foot (via the spectacular Via Krupp or the old Via Mulo), by bus, or by taxi. According to local legend, the Bay of Marina Piccola, situated almost directly opposite the Faraglioni, was once inhabited by sirens. One of the island’s most famous bathing establishments is Anacapri's Faro di Punta Carena, on the southwest coast of the island. Lying at the feet of the lighthouse (the second most powerful in Italy), here the sun is guaranteed from dawn until dusk. The terraces of Punta Carena provide the idyllic setting for a romantic candlelit dinner or sunset aperitif. The Faro can be reached from the center of Anacapri by bus or on foot, along the Viale Tommaso de Tommaso and Via Nuova del Faro. Again, from the center of Anacapri, by bus or by way of a pleasant 20 minute downhill walk, visitors reach the Bay of Gradola, situated just a few meters away from the famous Grotta Azzurra. This peaceful bay is the perfect place in which to relax in the sunshine and savor the delicious fish cuisine served in one of the area’s highly acclaimed water-edge restaurants. Those planning to visit Capri should not expect to find long or sandy beaches here. The island’s dramatically beautiful coastline is often impervious: characterized by steep cliffs, narrow gorges and tiny, rocky inlets. With the exception of the pebble seafronts of Marina Grande and Marina Piccola, the majority of Capri’s "beaches" are formed by a series of platforms created in the rocks, directly above the sea. Many of the island’s most enchanting coves can only be accessed from the sea. Be they owners of one of the luxury yachts moored in the harbor of Capri or back-packers on a budget, big spenders or resolute window shoppers, everybody coming to Capri should take the time to stroll through the historic centers of Capri and Anacapri and pay a visit to the island’s fascinating craft shops, artists’ studios and delicatessens. Capri’s Via Camerelle is tantamount to fashion addicts heaven, a spectacular open-air catwalk which commences in front of the Grand Hotel Quisisana and concludes at the start of Via Tragara, lined with boutiques in which to admire the extravagant creations of all the world’s greatest clothes and jewelry designers. Those looking for a special gift for those back home might easily find what they are looking for in one of the local cobblers or tiny haberdashery shops, ideal place where to pick up a pair of made-to-measure sandals or an item of handmade lace or embroidery. Alternatively, visitors can join a tour of one of the laboratories where the island’s flowers are used to produce the most exquisite scents. High on the list of the island’s most popular edible souvenirs, Capri’s Limoncello, a liqueur produced using the island’s delicious lemons, is sold in bottles of every size and shape imaginable and in the form of wickedly delicious liqueur-filled chocolates. The long balmy nights of Capri commence in the shadow of the historic bell-tower, with an aperitif or cocktail among friends at one of the Piazzetta’s pavement cafes, by far the best place where to witness Capri’s glamorous evening people parade and experience the colors and music which animate the island for many hours after the Mediterranean sun has set. Lining all of the Island of Capri’s most fashionable streets, world-famous discos and stylish bars alternate with the most exclusive of night clubs. In the taverns, holidaymakers get the chance to join the locals, dancing to the rhythm of the traditional Neapolitan tarantella. Ever since the notoriously hedonistic Emperor Tiberius elected the island as his Mediterranean pleasure dome in 29AD, Capri has been attracting visitors to its sunny shores with the promise of lasting wellbeing. In recent years, a growing number of the island’s hotels have added wellness facilities to the range of services offered and the best have created full-blown Beauty Farms in which their guests can enjoy both traditional spa therapies and the latest in contemporary wellness treatments: from massages to Kneipp baths, from saunas to state-of-the-art medical spa products. A tour around the island of Capri by boat is, without doubt, a unique and truly exhilarating experience. The spectacularly dramatic coast of Capri is characterized by numerous creeks, tiny bays and caves. On sunny days, beneath the crystal clear waters, one can see a seabed rich in flora and fauna, including great banks of poseidonia oceanica, of such vital importance for the health of the sea'''. Villa San Michele in Anacapri was the home of the Swedish physician, Axel Munthe. Built on the ruins of an ancient Chapel dedicated to San Michele, the villa now belongs to the Axel Munthe Foundation and has been transformed into a Museum. In his book "The History of San Michele", the Swedish doctor tells of his arrival in Capri in 1885 and the progressive construction of the villa; which followed a series of sketches made on a wall rather a precise set of plans. Emperor Tiberius' residence in Anacapri. Villa Damecuta is one of the twelve Imperial Roman villas to be found on the Island of Capri. Only a few ruins remain and it is difficult to ascertain whether it was lived in only by Tiberius or was also used by Augustus. The few traces which remain have allowed experts to identify an 80 meter long loggia with portico, opening out towards the Gulf of Naples, which terminated in a large semicircular viewpoint. It is believed that in 79 AD, the Villa of Damecuta was abandoned following the eruption of Vesuvius. On the ruins, in the Middle ages, a watch tower was built, and later, in the eighteen hundreds, the surrounding zone was fortified. Before reaching the villa di Damecuta, there is a weather station belonging to the Italian Air Force. Emperor Tiberius' magical blue nymphaeum. Capri's Blue Grotto is known throughout the world for its size, the intense blue tones of its interior and the magical silvery light which emanates from the objects immersed in its waters. Visitors can reach the Grotta Azzurra either by bus or taxi from Anacapri; or by boat from Marina Grande in one of the tour boats which stop at the entrance of the cave during the trip around the island. In order to enter the Grotta Azzurra visitors climb aboard small rowing boats, with a capacity for two, maximum three, passengers and, lying on the bottom of the boat, enter the low and narrow mouth of the cave. Entrance to the cave is not possible in the presence of south westerly and mistral winds. The entrance to the Grotta Azzurra is formed by a small natural opening in the rocky wall, roughly 2 meters wide and 2 meters high. Guarded by Capri's lighthouse, bathed in sunshine from dawn 'til dusk. Punta Carena is situated on the far south-west of the island of Capri, on the Limmo peninsula, the name of which derives from the latin limen meaning boundary. Behind Carena point looms the precipice of the Migliera, lined with defense walls built by the British at the start of the eighteen hundreds in order to protect Capri from invasion. A dramatically beautiful coastal path, dotted with Capri's ancient block houses. The Sentiero dei Fortini pathway links the zone of the Lighthouse of Punta Carena with that of theGrotta Azzurra. The route, scattered with rocky masses, sculpted promontories, and bays as deep as fiords filled with turquoise blue waters, has been recently repaired, as have the three blockhouses Orrico, Pino and Mesola which are united by the path. The Island at your feet. From the center of Anacapri, the summit of Monte Solaro can be reached by foot in approximately an hour and a half. Alternatively, visitors can take the chair lift, thereby arriving at the peak in just 12 minutes. Here one finds the ruins of the "Fortino di Bruto" built at the start of the 1800's, in the period of the battles between the English and the French. Monte Solaro is the highest part of Capri, towering 589 meters above sea level, and boasting a 360° panorama of the island of Capri. In the distance, the mountains of Calabria, the Pennines and the Amalfi coast, the Sorrentine peninsula, the Gulf of Naples, and the islands of Procida and Ischia can be identified. In the fifties the "Canzone del Cielo" complex was built, with swimming pool, solarium, restaurant and American bar. The latter remains open for business to this very day. Gardens and footpaths suspended above the sea. The Gardens of Augustus are a fine example of Capri's botanical ornamentation, with the flowers andplants of Capri being used to form an ornate picture frame for the island's breathtaking panoramas. The creation the Gardens of Augustus dates back to the nineteen thirties when the terraces on which the gardens still lie were constructed. Via Krupp connects the area of the Charterhouse of San Giacomo and the Gardens of Augustuswith Marina Piccola, once linked to the town exclusively by way of Via Mulo. Commissioned by the German industrialist, Friedrich Alfred Krupp, the pathway was built in the early 1900's, overcoming a difference in height of approximately 100 meters, Via Krupp was designed and realized by the engineer Emilio Mayer, who cut through the rock until the sea, creating a series hairpin bends set so close together they appear almost to overlap. Emperor Tiberius' most magnificent island residence. Villa Jovis is situated at the end of Viale Amedeo Maturi, where one finds a number of steps faced with marble slabs originating from the Roman Villa. Villa Jovis, built in the first century B.C. and attributed to Tiberius, was chosen for its position on the cliff's edge which guaranteed both privacy and security, of vital importance to the Emperor. Convent, prison, and school in the heart of Capri. The construction of the monastery of the Charterhouse (Certosa di San Giacomo) was initiated in 1363-65 by Giacomo Arcucci on land donated by Queen Giovanna 1st of Angiò. In 1553 restoration work commenced, including the enlargement and fortification of the building and the addition of a tower to the South which subsequently collapsed in the eighteen hundreds. The island's second 'comune', is home to a maze of tiny little lanes, barrel vaulted cottages and a quite unexpected Earthly Paradise. From Piazza Vittoria, proceeding along the pedestrian road to the left of the Monument in honor of the victims of the war, one finds the Casa Rossa. The Casa Rossa is realized in a mixture of architectural styles with mullioned windows and crenellations. Through the doorway one can glimpse the form of a square tower and arcaded courtyard. The house belonged to the American Colonel, John Cay H. Mackowen, who arrived in Italy immediately after the American Civil War and settled in Anacapri until 1899. He followed the example of Axel Munthe: collecting and conserving within the walls of his residence numerous archaeological artifacts which he managed to recover on the Island of Capri. Piazza Umberto I is otherwise known as the legendary "Piazzetta" which, from the white columned terrace of the funicular railway, opens out on to a fabulous view of Monte Solaro. The Piazzetta is the center of the island of Capri for tourists and locals alike. All those arriving in Capri have to pass through the narrow passages left between the tables outside the various bars, bars where the locals meet for lunch or simply to chat, guaranteed a little privacy by the umbrellas supposedly used to protect customers from the sun. The Faraglioni are three blocks of rock which have survived coastal landslides, erosion by the sea and all manner of atmospheric corrosion. The rocks have each been given a name: the first, still attached to the land, is called Stella, the second, separated from the first block by a stretch of sea;Faraglione di Mezzo and the third, Faraglione di Fuori or Scopolo, in other words the head or promontory stretching into the sea. 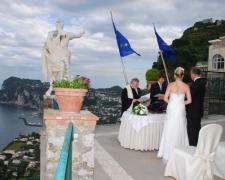 Wedding Ceremony in Capri Capri: right choice for a glamorous and fairy wedding!